On April 6th a beacon of light went dim— the self proclaimed “Painter of Light”, Thomas Kinkade went to his heavenly home. Kinkade was known for his paintings of cozy gingerbread cottages, saccharine Americana, and bucolic bliss. Kinkade was even more well known however for his methods of production and distribution. While a handful of artists sell their work for millions, Kinkade’s approach allowed him to sell millions of works— which landed in an estimated 10 million American homes. His work, or at least reproductions of them can be found on anything from mugs to throw rugs to keep you comfy by the fire as you watch “Christmas Cottage” a film inspired by Kindade’s life starring Marcia Gay Harden and Peter O’Toole while siting in your Kinkade La-Z-Boy recliner. While he was dismissed by the art world, he was fond of stating that evidenced in his financial success and popularity it was the art world, and not he that was irrelevant. 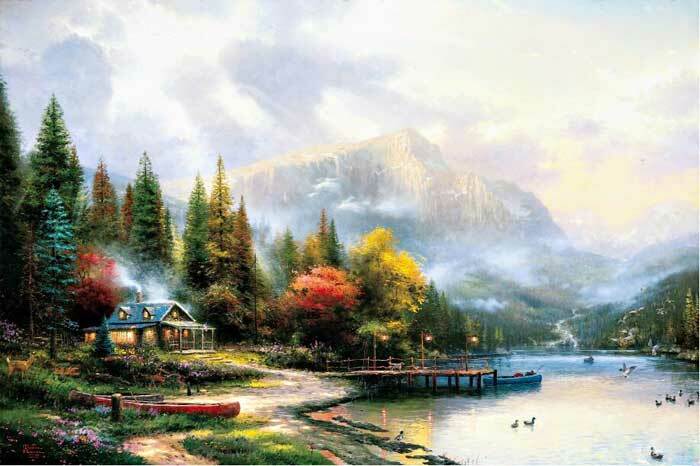 Kinkade’s popularity tells us something about ourselves, about our yearning for the fantasy of an imagined past, one where the bastions of “patriotism” and “family values” remain intact in virginal eternity. This path, like the ones that filled Kinkade’s paintings will undoubtedly lead to trouble. Kinkade’s cottages appear not welcoming but sinister, as if ablaze from within, if you stumbled onto one you could expect to be pushed inside an oven by a witch, his trademark glowing skies are reminiscent of the eerie light that happens before a tornado. Kinkade’s life had a dark side as well, he died of an overdose of valium and alcohol.